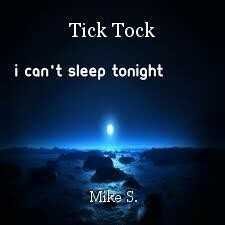 Tick Tock, poem by Mike S.
imagination's vision as you stare at the clock. feel the vise of the past closing in, of the future too. Of the past, won't change it, of the future, cannot know. Now you're up, not alert, and writing this poem. Yep, those ghosts of insomnia can be a pain to deal with. Excellent, Mike!